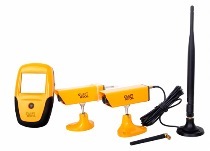 SH03 - Swift Hitch Back Up Camera System - Free Shipping at Carolina Classic Trucks, Inc. When checking out, get Free Ground Shipping. 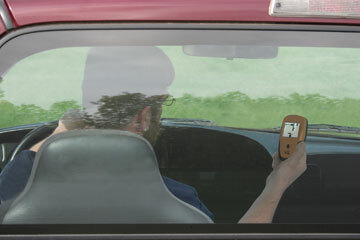 Attach the Camera to the vehicle using its magnetic base. Two portable wireless cameras that each have an internal rechargeable battery which allow for up to 10 hours of usage with a full charge. Full color 2.5" LCD screen with high resolution 960x240, with normal and reverse imaging. Top right easily accessible toggle switch to view images from two cameras. Extended antenna with a 9 ft cable that attaches to one of the cameras. Magnetic base on both cameras. Infra-red for night vision on both cameras. Both cameras are water resistant. Triangular suction cup mount which allows a camera to be mounted on a non-magnetic surface. Cigarette lighter charging adapter with two connectors to allow charging of two devices at the same time. 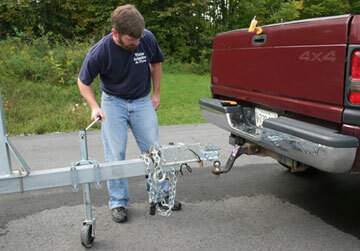 Hitch up a trailer using two views � watch the towing vehicle�s trailer hitch and the trailer being towed. Watch horses in a trailer from two different camera positions. Monitor the trailer load being towed from two locations. View two sides of your truck or trailer. Inspections or surveys from two different angles at the same time. No installation or wiring is needed. One year limited warranty is included. SH03 system is based upon proven Swift Hitch technology that has been in existence since 2006 with thousands of satisfied users.